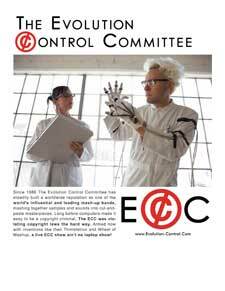 Since 1986, The Evolution Control Committee has steadily built a worldwide reputation by creating sample-based music of questionable legality. We have been violating copyright laws since it was difficult. The ECC is also very active in performing our music live -- and since our music doesn't lend itself to live performance, this is no easy feat. The proof is below, in the form of our 2007 press/promo pack, including publicity photos, one-sheets, press clippings, and videos. If you are interested in booking The ECC and would prefer a printed version with DVD, please contact us. 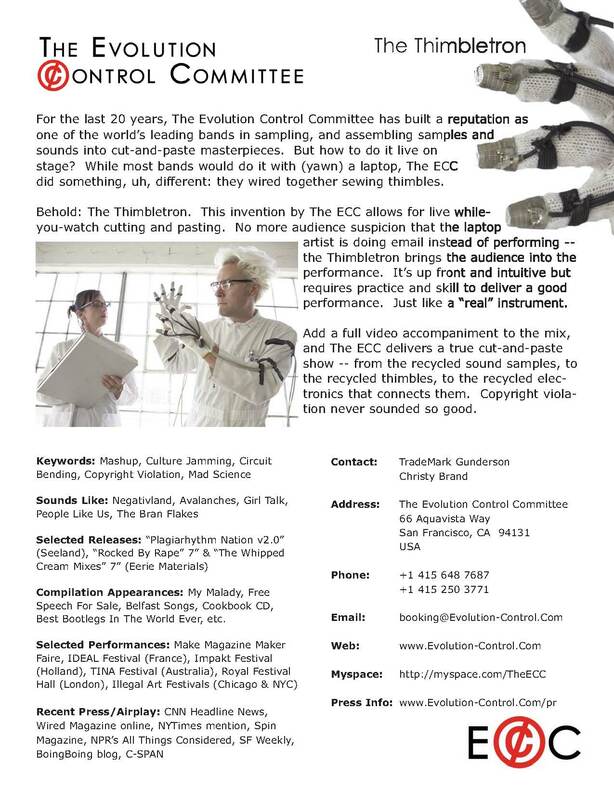 The ECC has toured their engaging and active live performances in cities and countries worldwide. 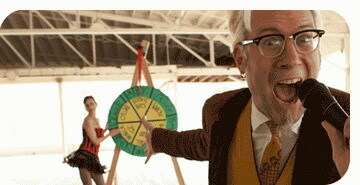 Currently, we are offering four very different live shows: our dance/club show The Wheel Of Mashup, our long-running mad-science Live Infringement: The Thimbletron, the Reels Of Steel movie soundtrack mashup, and The Kitchen Of The Future. 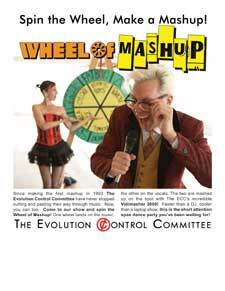 The Wheel of Mashupis our latest booty-shaking incarnation, mashing-up unlikely pop music combinations into dance floor mayhem. 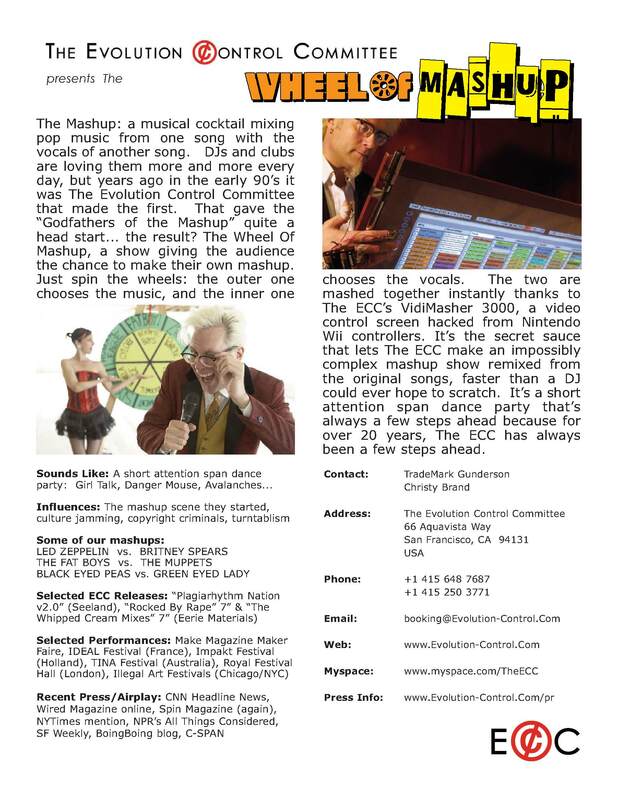 It’s mixed up live: the audience spins The Wheel Of Mashup to create new mash-ups, mixed instantly with The ECC's amazing VidiMasher 3000! 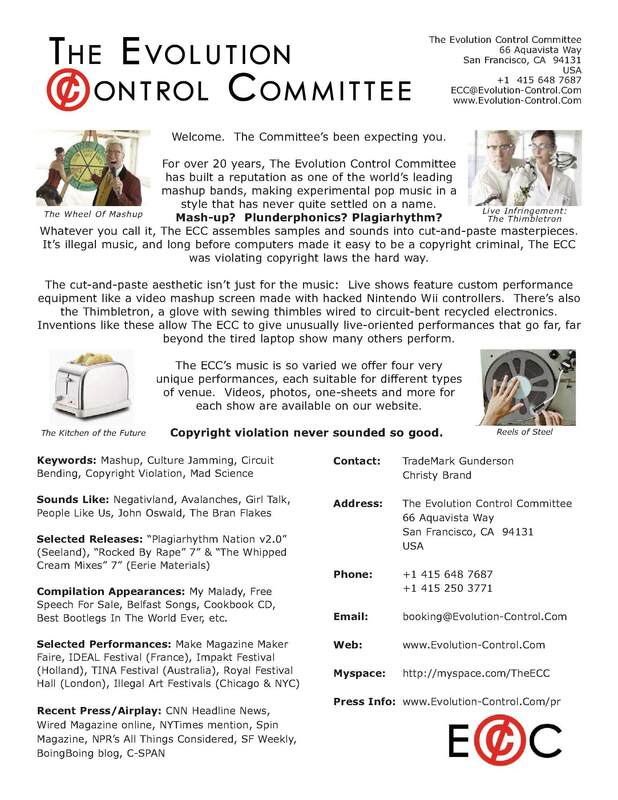 Live Infringement: The Thimbletron is our best-known, long-running performance using our custom-built Thimbletron to perform copyright-violating, cut-n-paste music. This show has travelled internationally since 2000. 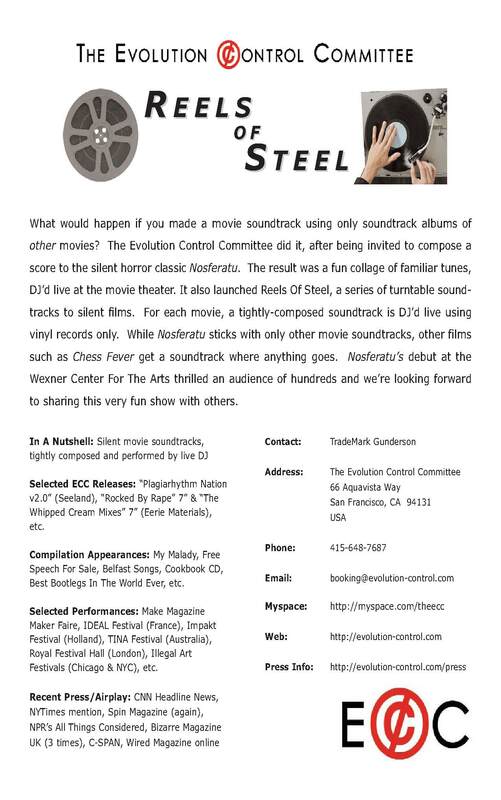 Reels Of Steel combines silent movies with a live DJ, spinning an intricately-composed soundtrack at breakneck speed. DVD now available -- contact us! 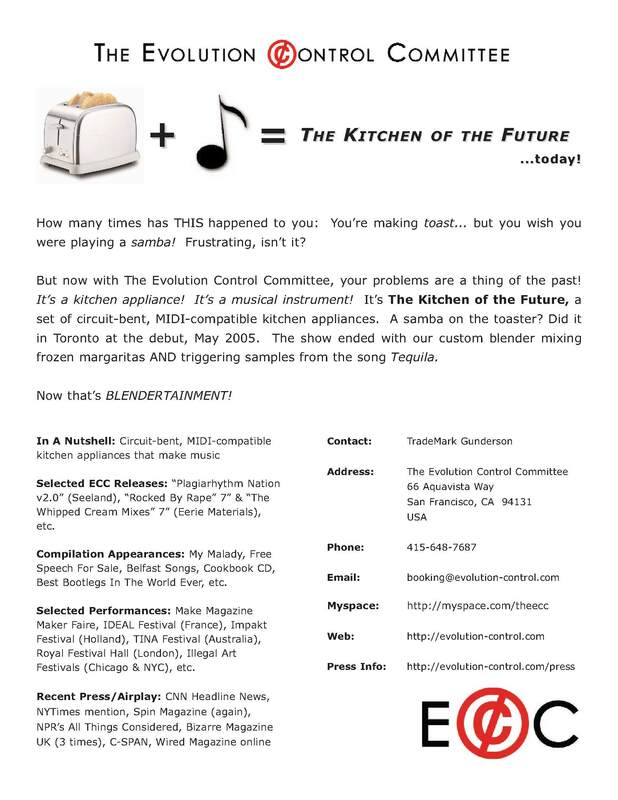 The Kitchen Of The Future... today! 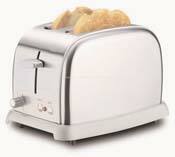 Circuit-bent, MIDI-compatible kitchen appliances make delicious music: get down wit yo’ funky breakfast.